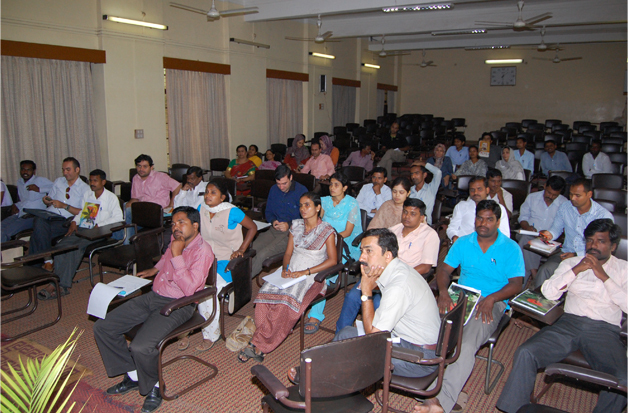 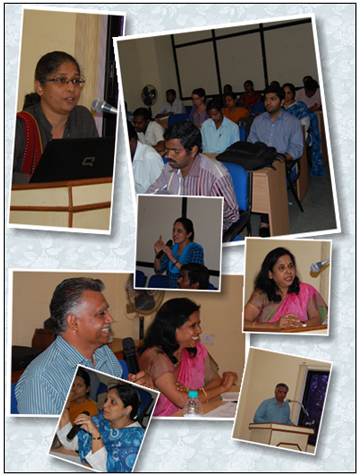 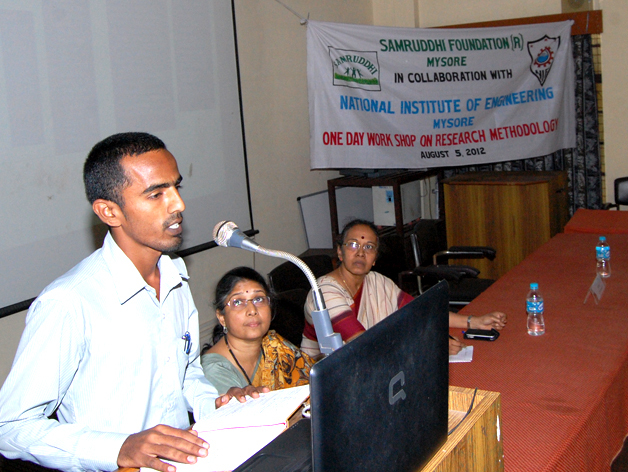 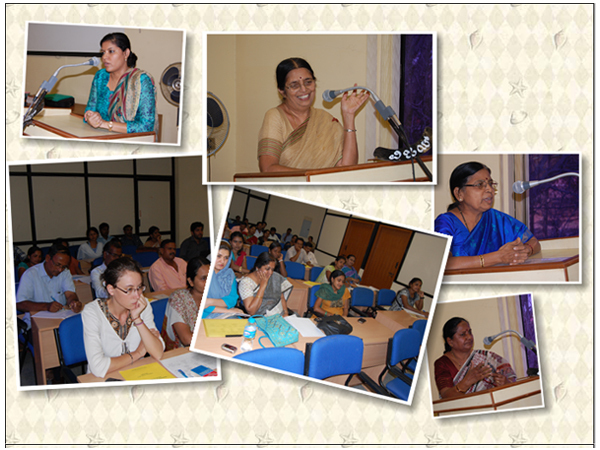 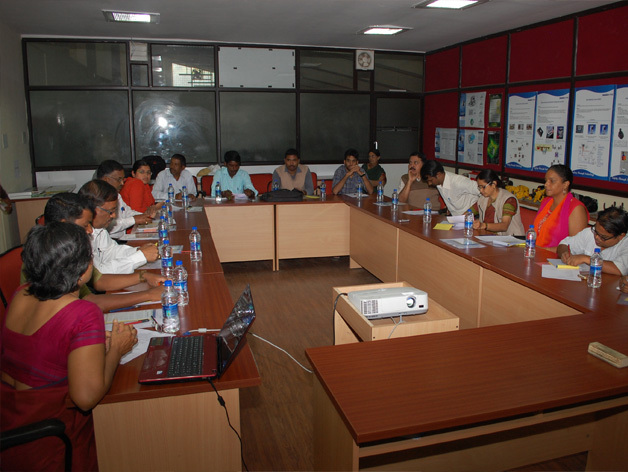 One day workshop on Research Methodology held on August 05, 2012 at NIE, Mysore. 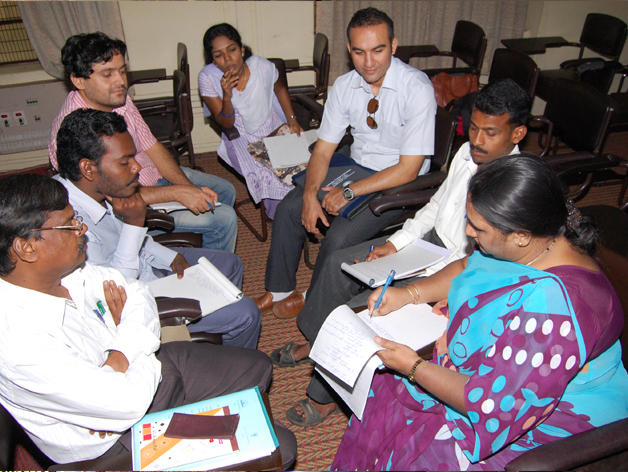 February 18 – 22, 2013 at Mysore. 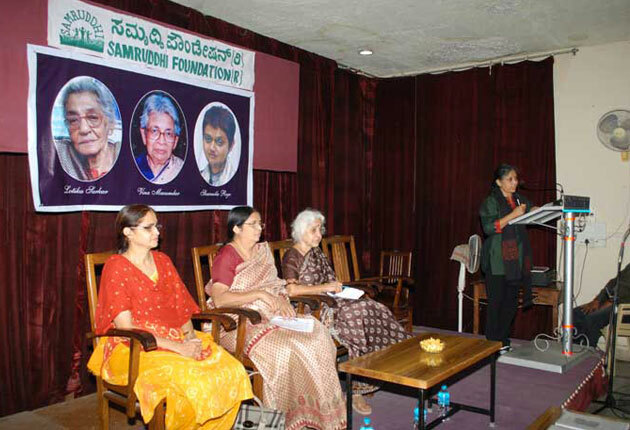 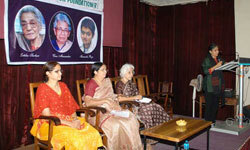 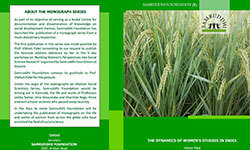 Samruddhi Foundation paid a tribute to three great feminist scholar-activists Professors Lotika Sarkar, Vina Mazumdar and Sharmila Rege on July 26, 2013. 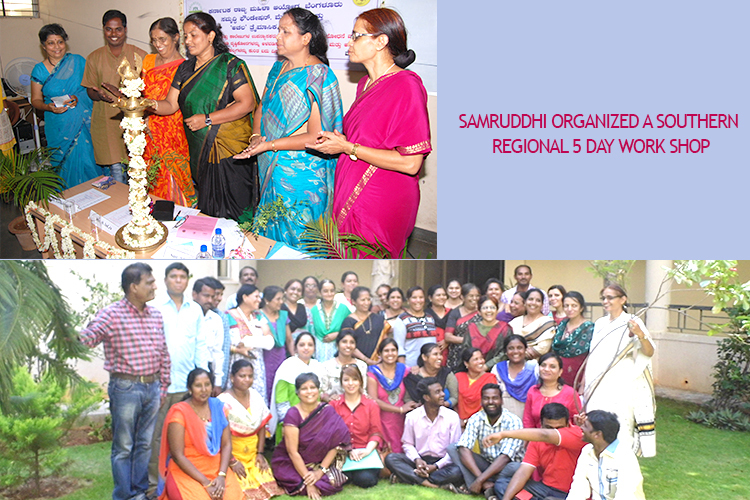 As part of its commitment to work with children, Samruddhi donated writing note books and pens to all the 250 children of Shri Indira High School, Mysore on August 28, 2013. 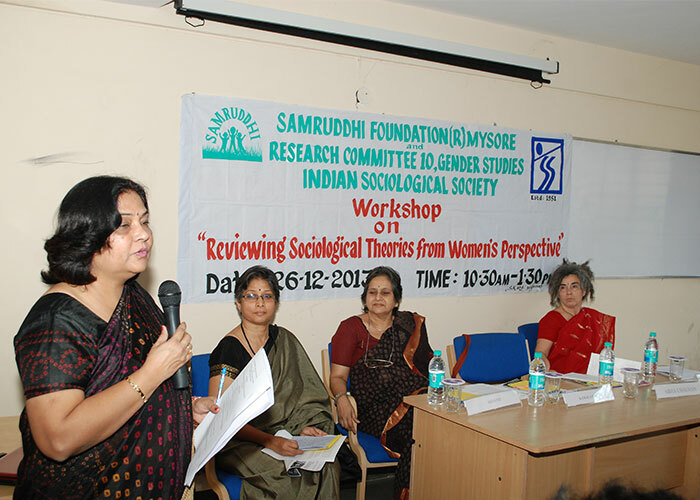 First Publication under Samruddhi’s Monograph Series “The Dynamics of Women’s Studies in India” ( Keynote address delivered by Prof. Vibhiti Patel at the 5 day workshop on Building Women’s Perspectives into Social Science Research). 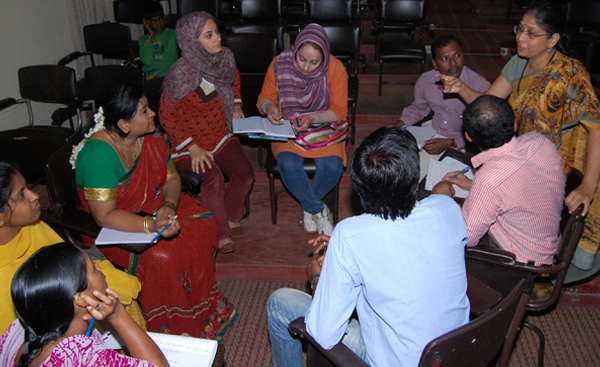 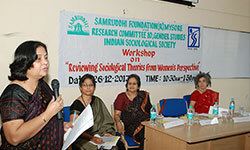 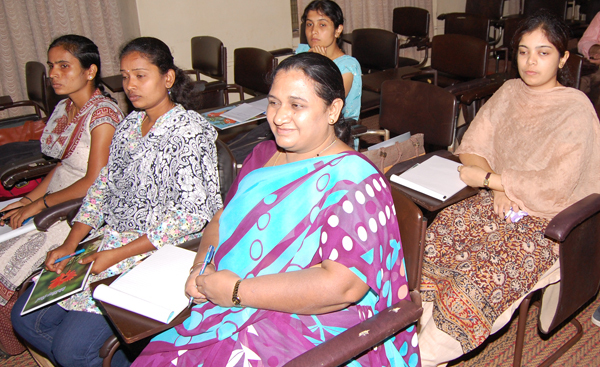 Workshop on Reviewing Sociological Theories from a Women’s Perspective organized under the joint auspices of Samruddhi Foundation and Research Committee 10 of the Indian Sociological Society on December 26, 2013. 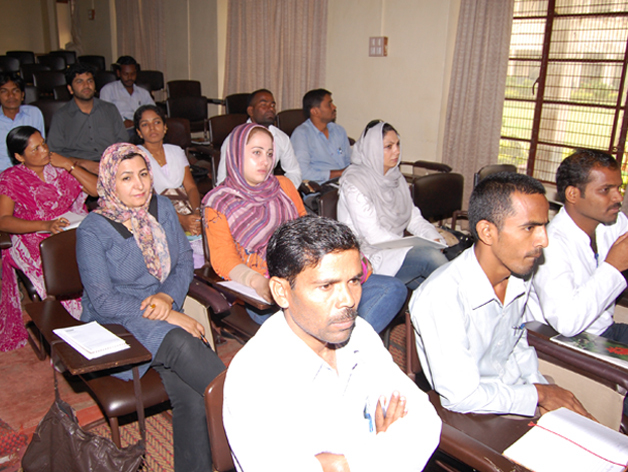 Prof. Kamala Ganesh of Mumbai University, Prof. Laura Corradi of University of Calibria, Italy and Prof. Abha Chauhan of the University of Jammu participated in the workshop and delivered lectures. 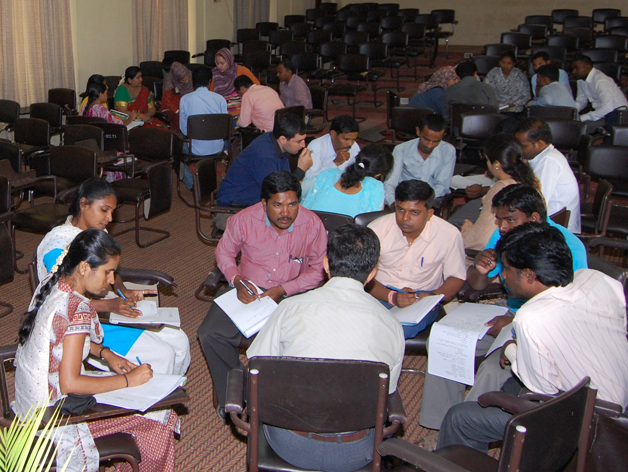 A Brain Storming Workshop on Issues related to Implementation of MNREGA in Forest Regions was organized on September 7, 2014 to initiate the activities of the Karnataka Forest Department sponsored project on Impact of the introduction of the Mahatma Gandhi National Rural Employment Guarantee Act (MGNREGA) on Forest Dependent Communities living in Nagarhole National Park , BRT Wild Life Sanctuary and the Buffer Zones of the Bandipur National Park awarded to Samruddhi Foundation. 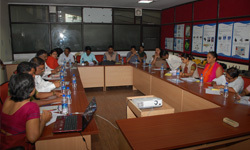 Representatives of the Karnataka Forest Department, members of NGOs working in the field area, experts involved in studies on the operation of MNREGAin different parts of Karnataka and researchers participated in the workshop. 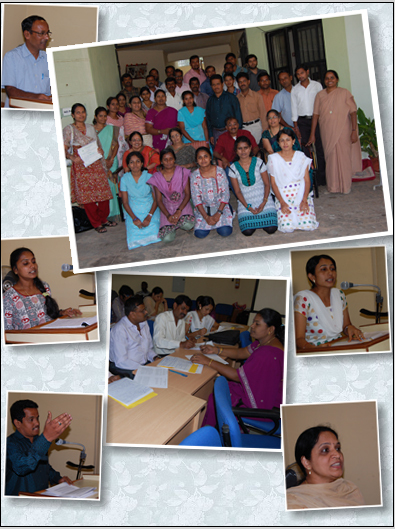 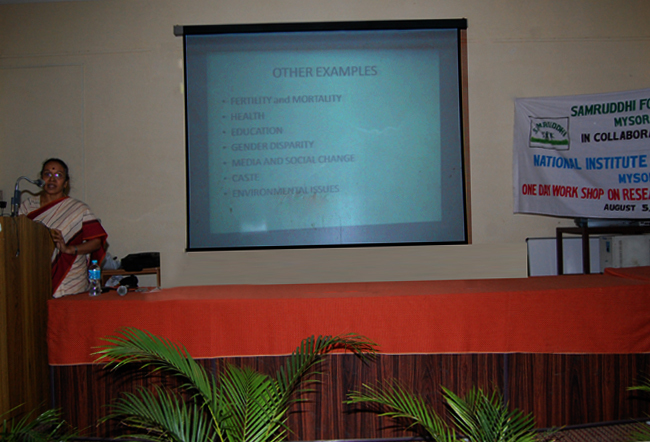 Workshop on ‘Gender Awareness' for Social Work Students of the Pooja Bhagawat Memorial SBRRM PG Centre, Mysore. 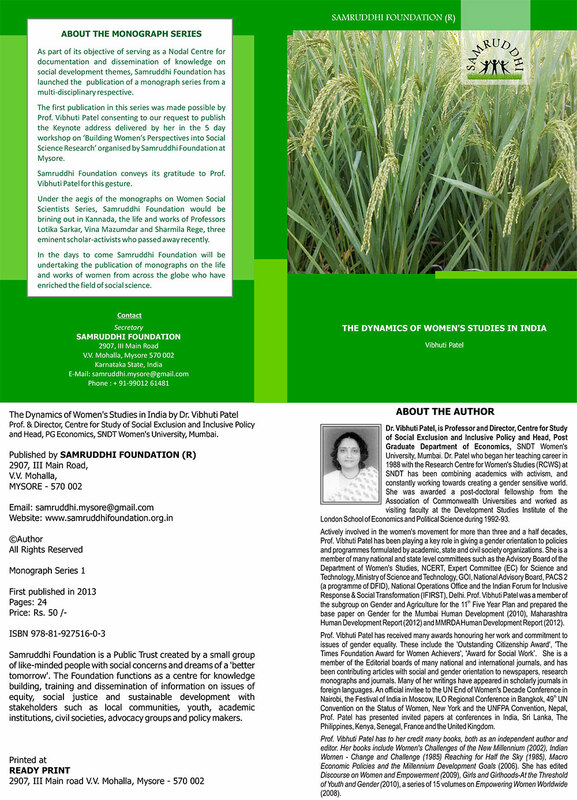 (Prevention, Prohibition and Redressal) Act 2013. 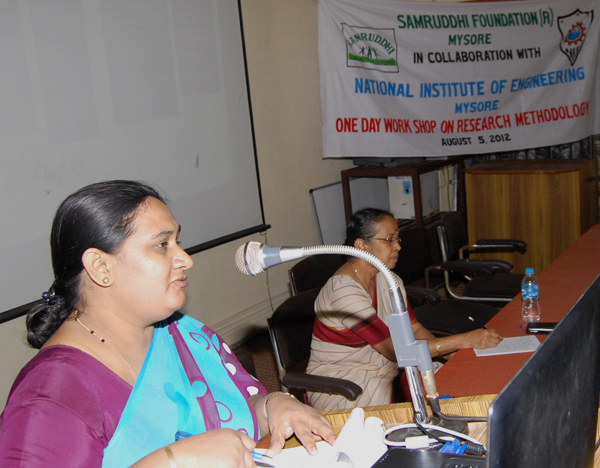 Workshop for Women College Teachers and Administrators in Mysore and Chamarajanagar districts on Sexual Harassment at Workplace (Prevention, Prohibition and Redressal) Act 2013 Organized in connection with The International Women’s Day on March 8,2015 in collaboration with National Institute of Engineering, Mysore. 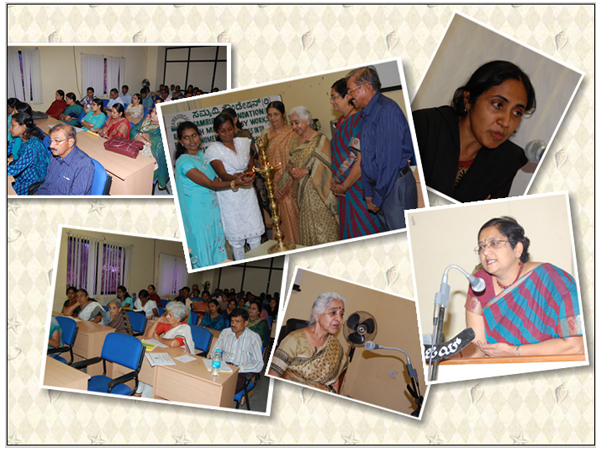 Act 2013 for women students of JSS Poly-technique, Nanjungudu. 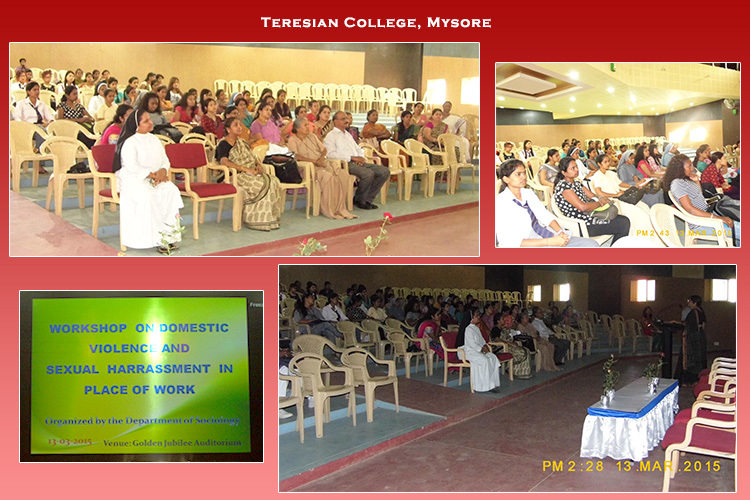 Workshop on Domestic Violence Prevention Act and Sexual Harassment at Workplace Prevention Act for students of Teresian College, Mysore. 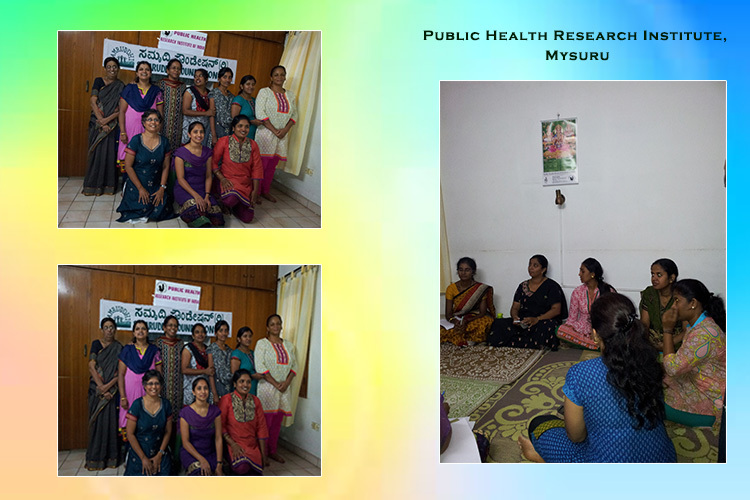 Training programme on Conducting Focused Group Discussions and under taking Survey in collaboration with Public Health Research Institute, Mysore. 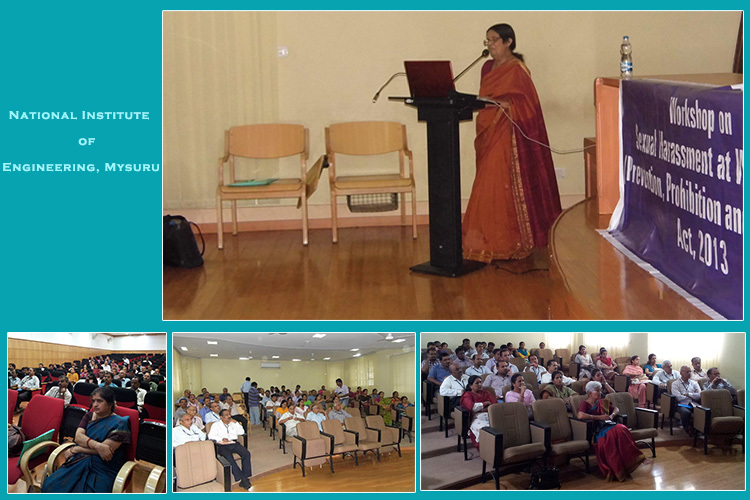 Samruddhi organised awareness building workshops on Sexual Harassment at Workplace (Prevention, Protection and Redressal ) Act 2013 for the staff of Larsen & Toubro, Mysore. 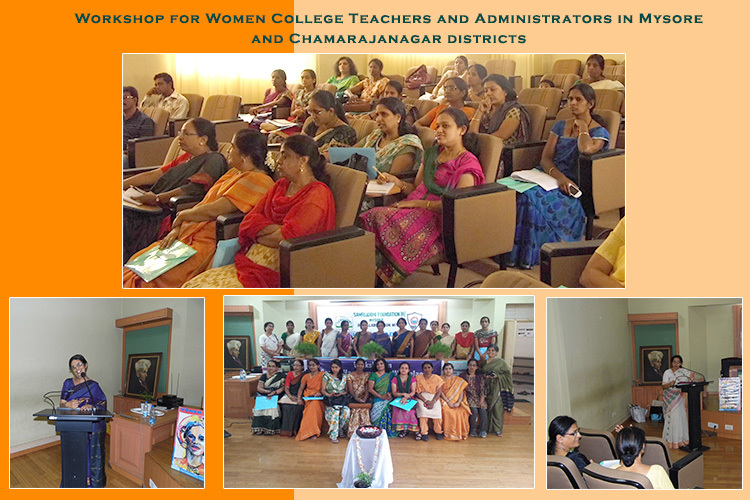 In association with Karnataka State Women’s Commission and ‘Achala’ quarterly, Samruddhi organized a southern regional 5 day work shop on ‘techniques and skills involved in addressing issues of gender in teaching and research’ for faculty and research scholars of social science disciplines and coordinators of centers for women’s studies of universities and colleges. 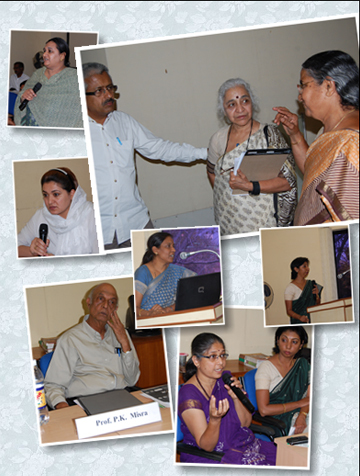 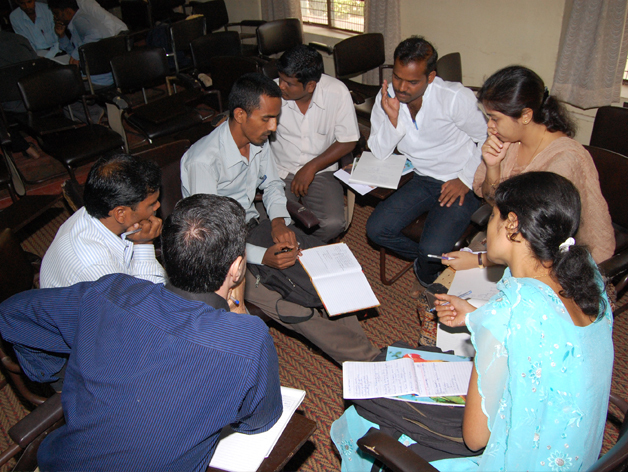 Teachers and researchers from Karnataka, Telangana and Maharashtra participated in the workshop. 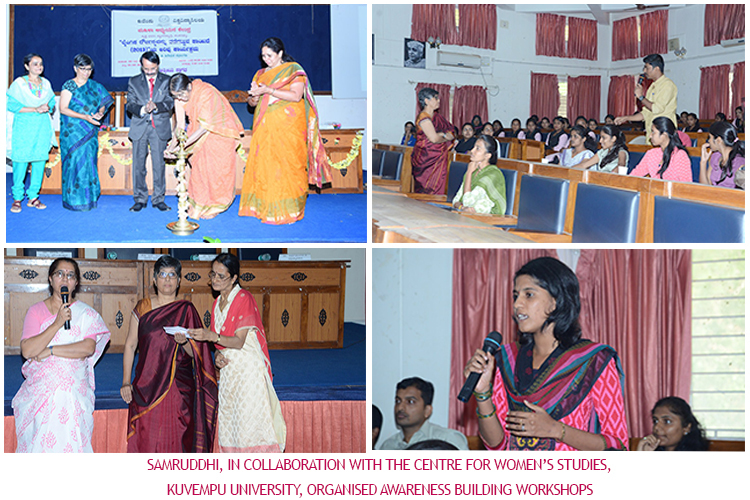 Samruddhi, in collaboration with the Centre for Women’s Studies, Kuvempu University, organised Awareness Building Workshops on Sexual Harassment at Workplace (Prevention, Protection And Redressal ) Act 2013 for the Faculty, Students, Research Scholars and Administrative Staff of the University.